I just saw this game recently got its own page at The Cutting room Floor, and that made me remember how I had never been able to find a Pro Action Replay code to choose the current level you're in. The closest I got were two memory addresses that change with the current level, and take their ids for a list that's also used in the "this is a work in progress" screen. However, it turns out that those IDs are not their true internal level code. Those memory addresses were FFA52B and FFEE23, the latter one documented at TCRF along with FFEE20 as being part of said "work in progress" screen. So I thought, what could the inbetween values do? It's interesting to see how there's three distinct groups of unused levels. I'd say this would hint at them reserving space for Slobbin' Hood, Bonehead the Barbarian and whatever the Ancient Rome level was going to be called, but other lost levels might have belonged to those level slots at one time (the train stage in Catsablanca, for example). Oh yeah, the Moon level. How do I know that slot belonged to it? Try using the code FFEE21:20 in any level and watch Garfield jump with slower than usual physics. Also, light saber sound effect. Wow, that's neat. I just found that ROM build date through corrupting and posted about it at the jul forums, didn't think it came from level select screen. Nice find. Yeah I know, that was another thing that made me curious about this game again, I was just about to post about it over there. Always kinda bothered me that the game seemingly had levels being shown on the box that weren't present in the actual game - notably some kind of train segment from "Catsablanca". -The game was in development hell and had to be "rebooted". 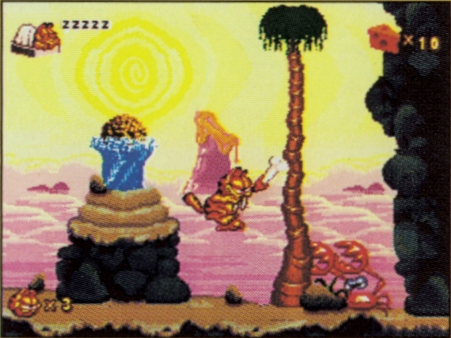 -Cavecat level was supposed to be the first, as the internal level order suggested. Everyone was mad at the spooky level being the first one in the final version. -There was some kind of "fake 3D" mouse hole maze minigame, at one point. -Garfield's animations were sent in by PAWS, in a similar fashion to how Disney sent Aladdin's to Virgin. -All game design was set in stone in form of a "thick design document". -It was stated to be the last in-house SEGA game for the Genesis. I still have a lot of people I need to reach out to who were involved with the game. There's one guy who msgd me back a few months ago but then vanished again. One of the artists also did the same a few years back. Finding these people has been a super slow process. Always hoped I can somehow eventually cover every single name in the credits. Maybe someday..
Also, I mentioned in that Assembler thread one guy had a garage he was going through. Sadly got word back from him he couldn't find anything. He made it sound like there could be a possibility there may be some box he missed, but yeah, this game is probably lost to time unless some other Sega Channel CD shows up. Iicr, I think the PC version by Expert (Renamed Garfield in TV Land) had the levels in a different order than the Genesis version. Dunno if they follow the same order as it was initially suggested. Yeah, I remember having that game. I really sucked at it, though. If I'm remembering it correctly, the first level was the prehistoric one (that I could never beat), but I did accidentally find the code to reach the Casablanca level. EDIT: To clarify, I had the PC version of the game. I grew up with the PC version. I tried the Genesis version later and was aghast that Cave Cat didn't come first. Looking into it more, I learned that the PC version has the correct order all along, no wonder the devs were pissed that they were forced to mix them up. Apparently the 3 cut levels were released on Sega Channel, but the wiki says no backups exist. That's massively disappointing, is there really no backup anywhere in the world? Sega's private archives don't count, obviously. At least the space level made it into the PC version. Unless Sega rereleases Garfield: The Lost Levels at some point, I don't think we'll ever see a dump of it. Unfortunately, there was no way for players to preserve Sega Channel downloads AFAIK, as it didn't use or support any kind of non-volatile storage. Well, we kind of found the guy who bought the lot of Sega's backups from a defunct company which had Sega Channel backups, but after getting some files out of the deal, everything went dark. Unless Sega rereleases Garfield: The Lost Levels at some point, I don't think we'll ever see a dump of it. I doubt PAWS would agree to that at this point, considering the specifically outlined document was clearly not followed. That bridge got burned. I'll always think it's weird how they threw these games in a PC collection together. Truly the new peanut butter and jelly. Where was it? Right in front of our noses.